The photos included here link to the original images on Britain from Above. If you want to see them clearly, in detail, as larger versions you can zoom in on, you have to register. It’s free and quick, and the larger originals are really worth seeing. I assume it’s just a happy accident that the aircraft happened to be passing this way at the time the factory was actually under construction. It passed by more than once that year, though I hadn’t realised until today. This photo is from 19 October 1926, with scaffolding gone, but it still looks very much ‘under construction’. And now, fully operational, six years later in 1932. 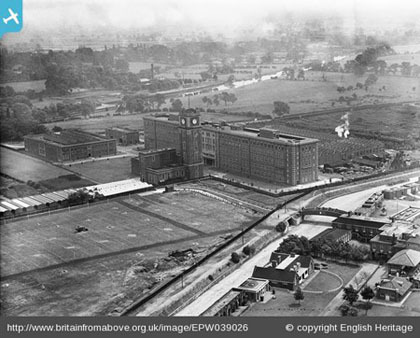 A view of the factory from the other side, the racecourse side, with the Ouse in the background. 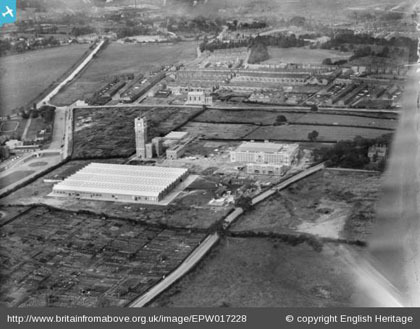 A search on the site found 14 photos of the factory buildings, and I thought it might be useful to collect them together in a group: www.britainfromabove.org.uk/groups/terrys-york. In doing this I’ve been designated ‘Group Leader’, a title which makes me feel I should organise some group games and activities or something. I won’t be doing that. But please do join this group and add any local info you have. The images, being aerial views, also of course show the surrounding area, other buildings in the vicinity. I’m also ‘Group Leader’ of a collection of images assembled last year, titled ‘York and Yorkshire‘ (but actually only York I think, last time I looked) which includes images of the city centre. 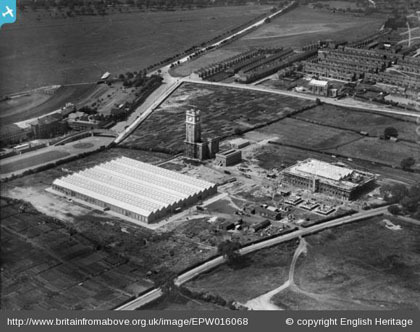 And also the (now demolished) sugarbeet factory, when it also was new. 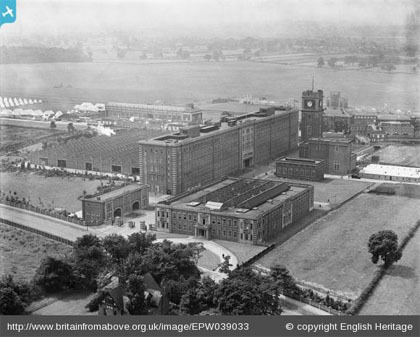 Important parts of our heritage, our industrial heritage, in images captured and preserved and free to view. So pleased that things like this are now being made available online. Terry’s captured on film (the moving kind) during a royal visit in 1937.